Since 1999 Healing Today Reiki Masters have attuned thousands of Reiki students all over the USA. Our group classes have been attended by healthcare workers (Physicians, Nurse Practitioners, RNs, LPNs, Physical Therapists, Dietitians, Massage Therapists), clergy, office workers, tradesmen, and others from all walks of life. Reiki is traditionally taught at three levels. The first class, known as Reiki level 1, teaches the student the basics of energy healing for self and others. Despite all that is accomplished with Reiki, it is a natural process, therefore easy to learn. No prior experience in health care or natural healing is required. The workshops are fun, very casual and beneficial to people of all ages and backgrounds. 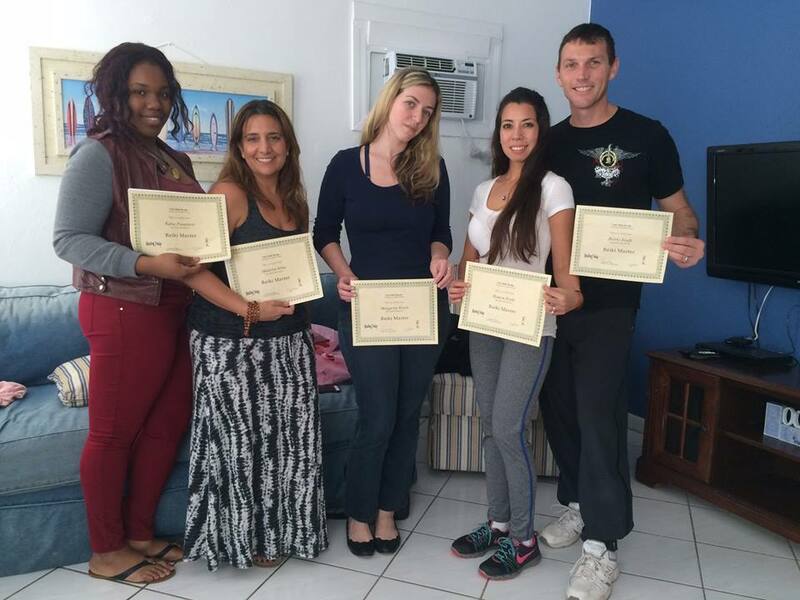 The Reiki level 2 class teaches the student techniques of distance healing. Also at this level the student is taught the Reiki symbols. The Reiki level 3 class is the Master/teacher level. At this level the student is taught the attunement process and the basics for teaching Reiki to others. The level 3 attunement is a wonderful experience and is highly recommended even if the student has no desire to ever actually teach Reiki to others. For more info please email to; info@healingtoday.com or call 813-748-0761. To learn more about Reiki please visit; Healing Today Reiki or Reiki FAQ. A Reiki level 1 class will be held on Saturday, January 12, near the junction of I-526 and US-17 (Savannah Hwy.) in Charleston, 29407. The classes are limited in size and must be pre-registered. Directions are sent with confirmation. The training is for traditional Usui Reiki. The student is taught the basics of Reiki including the hand positions for self healing and for the practice with others. The total cost for level 1 is $85.00 and includes attunement, handout, and certification. At the end of class you will receive your certificate. The class will be taught by Richard Fiallo, Reiki Master. Richard has been teaching and sharing Reiki with others since 1999 and has personally attuned over 8,000 different students. The classes are always fun, informative, and include lots of hands-on experience. The level 1 class will be from 10am-3pm. See below for info on level 2 class. A scheduled group workshop for level 2 will be held on Saturday, January 12, near the junction of I-526 and US-17 (Savannah Hwy.) in Charleston, 29407. The classes are limited in size and must be pre-registered. Directions are sent with confirmation. The class will be from 3pm-6pm. This is an all inclusive 1 day class. At the end of the day you will leave with your certificate. The level 2 class is open to anyone who has previously completed level 1. The cost for level 2 is $95.00 and includes attunement, handout, and certification. We realize that many students drive a long distance to attend these Reiki classes so we now offer the Level 1 and Level 2 classes at different times so that the student may take both classes on the same day. Of course this is the student's option. If you would like to take the Level 1 and Level 2 classes on the same day simply register for both. A Reiki level 3 (Reiki Master) class will be held on Sunday, January 13, near the junction of I-526 and US-17 (Savannah Hwy.) in Charleston, 29407. The classes are limited in size and must be pre-registered. Directions are sent with confirmation. This is an all inclusive 1 day class. At the end of the day you will leave with your certificate. The class will be from 10am-3pm. The level 3 class is open to anyone who has previously completed level 1 and level 2. The cost for level 3 is $185.00 and includes attunement, handout, and certification. The level 3 class in Traditional Usui Reiki is the Reiki Master/Teacher level. At this class the student is taught how to pass attunements to others and the basics for teaching Reiki to others. The class is always small for individual instruction. We often get students for Level 3 who have taken their Level 1 and Level 2 class with another teacher and that is quite alright. Please bring with you a copy of your level 2 certificate or the name of your teacher and register for only the Reiki 3 class. Please note: Group classes are limited in size and all seats are reserved. If you are unable to attend please notify Healing Today at least 48 hours before class. You may reschedule class for next class offered. No cash refunds. Healing Today Reiki Masters have provided Reiki Training to thousands of students throughout the USA. 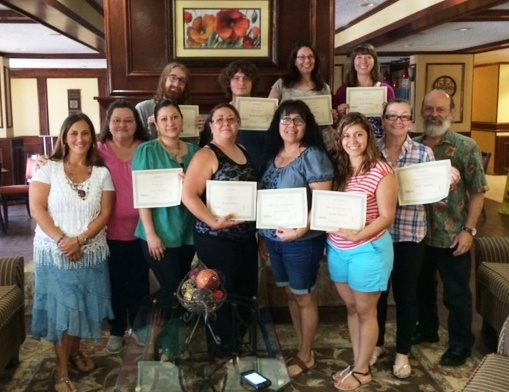 We are proud that many of these students are using Reiki on a regular basis in their personal and professional lives. Here are some photos and comments. Reiki is wonderful for self healing and also very beneficial to friends, family, pets and livestock. Mileage to the Reiki Classes in Charleston site. The Reiki class site in Charleston is a great location to serve many surrounding communities including Mt. Pleasant, Summerville, McClellanville, St. George, and more. Healing Today has always offered Reiki training at affordable prices so that more people are able to enjoy this wonderful natural healing modality. Even if the Reiki student has to travel to attend the Reiki seminars, we hope the low tuition will help to make it possible. The Reiki workshops in the Chicago area is a great location to serve many surrounding communities including Elmhurst, Addison, Franklin Park, Schiller Park, Palatine, Naperville, Wheaton, Arlington Heights, Elgin, Orland Park, and more. Healing Today has always offered Reiki training at affordable prices so that more people are able to enjoy this wonderful natural healing modality. Even if the Reiki student has to travel to attend the Reiki seminars, we hope the low tuition will help to make it possible. Mileage to Reiki classes site in Hartford, Connecticut. Mileage to Reiki classes site in Stratford, Connecticut. The Reiki workshops in the Stratford area is a great location to serve New Haven, CT and New York City and many surrounding New England communities including Manchester, Vernon, Windsor, West Hartford, Glastonbury, New Britain, and more. Healing Today has always offered Reiki training at affordable prices so that more people are able to enjoy this wonderful natural healing modality. Even if the Reiki student has to travel to attend the Reiki seminars, we hope the low tuition will help to make it possible. Mileage to Reiki classes site in Los Angeles, CA. The Reiki workshops in the Los Angeles area is a great location to serve many surrounding Southern California communities including Long Beach, Malibu, Anaheim, Torrance, Inglewood, Glendale, Hollywood, Beverly Hills, Santa Monica, Thousand Oaks, Van Nuys, Burbank, and more. Healing Today has always offered Reiki training at affordable prices so that more people are able to enjoy this wonderful natural healing modality. Even if the Reiki student has to travel to attend the Reiki seminars, we hope the low tuition will help to make it possible. The Reiki workshops in the Washington DC area is a great location to serve many surrounding communities including Sterling, Yorkshire, Burke, McLean, and more. Healing Today has always offered Reiki training at affordable prices so that more people are able to enjoy this wonderful natural healing modality. Even if the Reiki student has to travel to attend the Reiki seminars, we hope the low tuition will help to make it possible. Reiki workshops serving Chantilly Virginia, Reston Leesburg, Gaithersburg, Rockville, Columbia, Bowie, Silver Spring, Potomac, Falls Church, Annapolis, Alexandria, Arlington, Waldorf and other communities in Northern Virginia, Maryland, and Washington DC area. Healing Today Reiki classes are coming soon to Phoenix, Arizona, Albuquerque, New Mexico, Tucson, Arizona, and Oklahoma City, OK.
We are happy to present Reiki classes in New York City. training offered for all levels in and around New York city including Reiki home study courses. We are adding more and more locations for our Reiki classes. Soon to be coming to Portland, Oregon, Seattle, Washington, Indianapolis, Indiana, and several other cities across the USA Classes for leve 1 and level 2 and Reiki Master /teacher training will take place in Portland Oregon and Seattle Washington in Audust 200p. Dates for the Reiki workshops in the Northwest cities will be posted soon. If you would like to host Reiki classes in Washington cities; Seattle, Kirkland, WA, redmond, WA, Tacoma, Vancouver ,Washington, Tacoma, WA, Auburn, WA, please let us know by email. Anyone like to host Reiki classes in Oregon cities of Portland, OR, reiki training now available in New York City, Manhattan. e 2008 we will be offering Reiki classes for all levels in Cincinnati Ohio on a monthly basis. These affordable training workshops will be provided by Reiki Masters trained in several Reiki traditions. These classes are close to Lexington, Kentucky, Louisville, KY, Dayton, OH, Columbus Ohio, and much of southern Indiana Classes in Prattville, Alabama only 80 miles from Birmingham also near Troy, Tuscaloosa, and Mobile. We will present Reiki classes on September 13-14, 2014 for all levels in San Diego. certificate. The level 1 class is only $75 total and is on Saturday from 10am-3pm. The level 2 class is 3pm-6pm. There will also be a level 3/Reiki Master class on that Sunday. We will present Reiki classes on September 6-7, 2014 for all levels near convention center in Anaheim. Reiki Training in New Haven CT .